Publisher: Ruth Nyaboe November 12, 2017 This information is provided solely as a guideline. The complications of diabetes are many. Most organ systems in the body seem to be affected by diabetes complications. These complications can be prevented by learning what they are and working toward prevention. 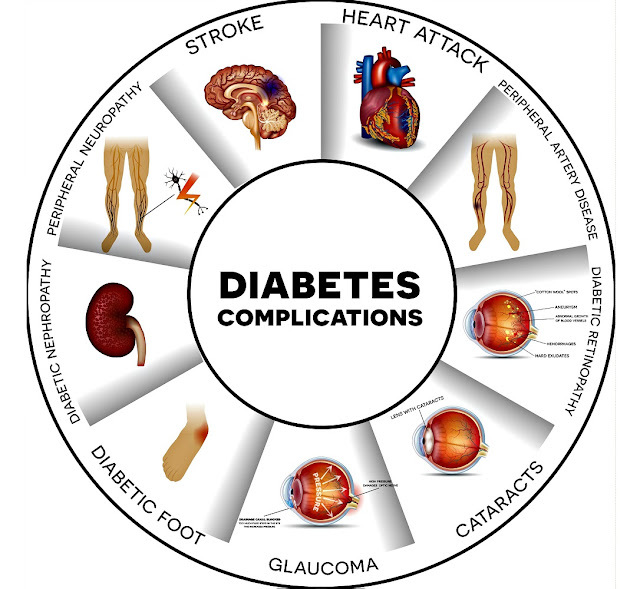 Several serious complications can result from diabetes. Most of the following complications are caused by blood vessel damage. Coronary heart disease: People with diabetes have two to four more risk of dying from coronary heart disease than do people without diabetes. Nerve damage: Between 60 and 70 percent of people with diabetes have some form of nerve damage. Foot problems: Because of peripheral nerve damage, foot problems can go unnoticed. Proper treatment for conditions such as athlete’s foot, blisters, and calluses is extremely important. Any sign of infection should be treated immediately to avert the need for amputation. Kidney damage: Thirty to 40 percent of people with type 1 diabetes and 20 percent of those with type 2 diabetes eventually develop kidney disease, which can lead to kidney failure. Peripheral vascular disease: Diabetes and smoking can double or triple the risk of peripheral vascular disease (atherosclerosis) in the arteries of the legs, which increases the risk of foot and leg problems, including the possibility of amputation. Skin problems: People with diabetes are at increased risk for skin infections. Stroke: People with diabetes have a two to four time’s greater risk of stroke. Vision loss: Diabetic retinopathy (retina disease) is the leading cause of blindness. People with diabetes are also at increased risk for glaucoma cataracts.